Britain is possibly counting down to towards the END of Theresa May's premiership who has been a walking disaster since Article 50 was triggered in March 2017, and who has likely DELIBERATELY WASTED the past 18 months in doing an exit deal with the EU Devil that effectively KEEPs the UK within the EU!, a deal where nearly every British red line has been watered down towards nothing in what amounts to a 585 page suicide note, one of virtually delivering Britain on a platter to the European Union Mafia which from the outset had sought to extract a heavy price from Britain such a Euro 50 billion divorce bill, free movement of people, Northern Ireland effectively split from the rest of the UK and over 500 pages more of similar poison, all in exchange for Britain to remain within a customs union for a few more years. In fact the more I look into the contents of this 585 page suicide note the worse it appears. For instance any member of the EU can supposedly vote to LEAVE the EU on 2 years notice. However, this so called DEAL states that the UK CANNOT LEAVE the EU WITHOUT the EU's permission! Thus the deal is designed to permanently KEEP the UK within the EU as a second class member! Getting rid of Theresa May looks like a necessary step towards avoiding the catastrophe of Theresa May's so called BrExit DEAL Against which my view from the outset of the triggering of Article 50 has been that it is in Britains best interests to LEAVE the European Union WITHOUT A DEAL! 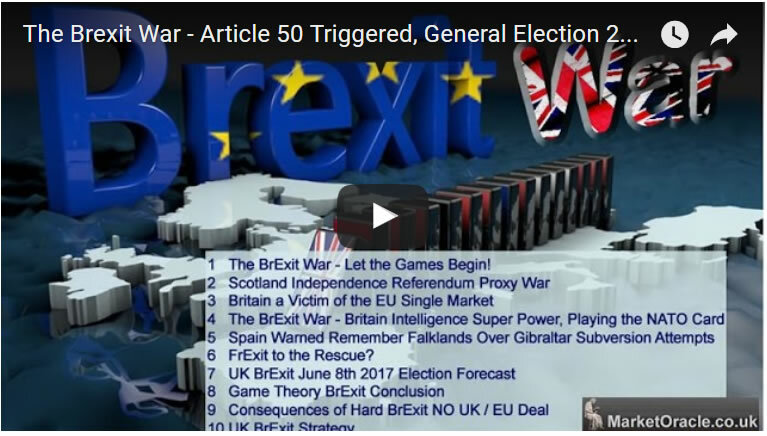 In fact at the time I laid out a BrExit Strategy that Britain could follow that would ensure the time between March 2017 and March 2019 was not wasted falling into the European Unions Brexit negotiations trap that Theresa May not only fell into as a REMAINER, but made things TEN TIMES WORSE following Theresa May's disastrous decision to call a general election on the 8th of June 2017 that delivered 'Chaos and Uncertainty' instead of 'Strong and Stable' which not only further shocked Britain's political and media establishment but also hit the UK economy hard, effectively suffering a heart attack with confidence fast evaporating as the economy slowed which to this day makes a mockery of the Bank of England MPC persisting with their talk of raising UK interest rates. 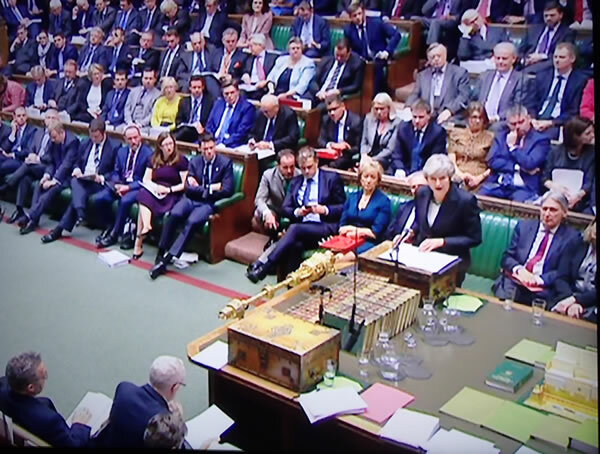 Theresa May, was and remains the wrong person in the wrong job at the wrong time who even surprised me by just how badly she has steered Britain through BrExit these past 2 years, leaving Britain effectively paralysed in the countdown to 29th March 2019. So the time has come to get rid of this walking disaster area in favour of someone with has the balls to carry out the settled will of the British people, one of LEAVING the European Union! In respect of which BrExit Secretary Dominic Raab's resignation on Thursday set the ball rolling on a leadership challenge to Theresa May's premiership. 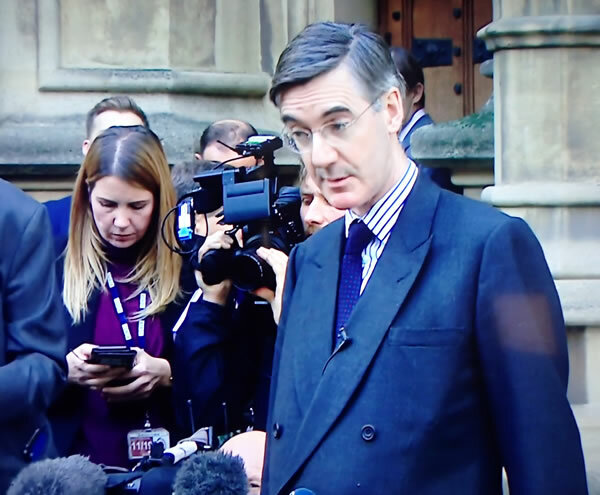 The next step was backbencher Jacob Rees-Mogg calling on a vote of no confidence in the Prime Minister by sending a letter to the Tory Party's 1922 committee and calling on other MP's to do the same. The committee requires 15% of Tory MP's (48) to write a letter to trigger a leadership challenge which is where we currently stand as of writing, awaiting the 1922 Committee to make an announcement of whether or not they have received at least 48 letters, where as of writing the tally according to SKY News is for 17 letters, so some way to go get to 48. Jacob Rees-Mogg Britain's Next Prime Minister? 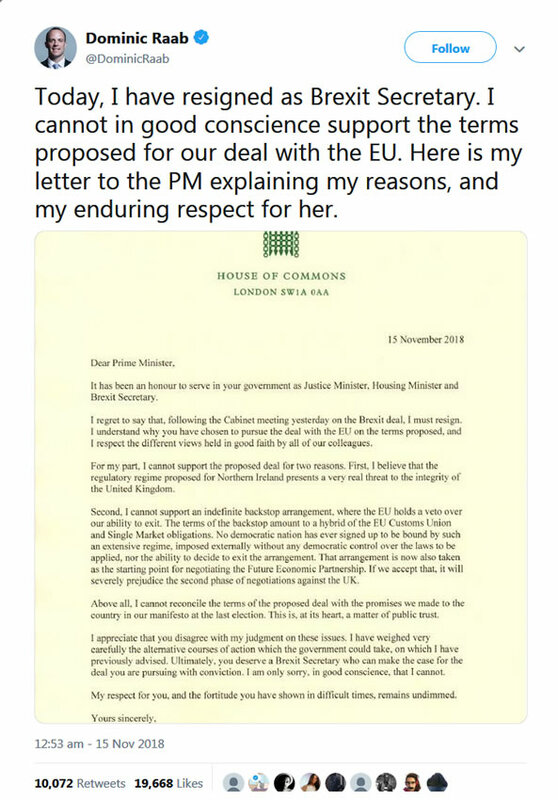 So what is likely to happen over the coming days if the 1922 committee declares that they have received at least 48 letters, triggering a leadership challenge, a vote that Theresa May would hopefully lose and be replaced as Prime Minister. Who could be Britain's Next Prime Minister? Of the above, I would rank the favourite as Jacob Rees-Mogg and then Boris Johnson. Hopefully, Britain gets a new Prime Minister who despite being at the head of a weak Tory government that likely won't last even a year before a general election is called, however will in the short amount of time he has make it his primary objective for Britain to ACTUALLY LEAVE the European Union on the 29th of March 2019 WITHOUT A SUICIDAL DEAL! Meanwhile the EU continue to prepare a party for the 25th of November to celebrate Britain's capitulation that could soon be cancelled. In two articles in April 2017 I laid out what the British government should do to ensure a successful BrExit outcome which is even more relevant today then when it published as Theresa May's 'Deal' is such a grand disaster that it is destined to fail and thus Britain is on a trend trajectory for a NO DEAL BREXIT. At the end of the day Britain has a trump card to play, which was apparent in my recent analysis on the impact of Tory Brexit chaos on Britains housing market, and that Trump card is QE, or good old Bank of England money printing. The BoE can do today what they did 10 years ago during the financial crisis which is to print money to inflate asset prices through buying Bank stocks and Government bonds which the banks hold. This would have the effect of allowing the Government to run a large budget deficit to offset BrExit economic consequences and thus Britain could just about avoid an economic recession (at least 2 consecutive quarters of a fall in GDP). Though in reality it is highly probable there will be a mild NO DEAL recession, probably resulting in a contraction of about 1.5% of GDP. Or about 1/3rd that of the 2008-2009 Bankster recession.